Pesticides are risky; they are designed to kill organisms that share many biochemical pathways and physiological processes with non-target species, including humans in some cases (National Academy of Sciences). While it is difficult to develop pesticides with large margins of safety, there has been much improvement in this area. The public generally is not familiar with credible information about pesticide risks and therefore is unaware of such improvements, which are vastly under reported in the media compared to the more dramatic (and usually less well documented) stories of their widespread dangers. Agricultural pesticides have become safer through the years. In assessing risks of pesticides, the Environmental Protection Agency and Food and Drug Administration use considerable safety factors in arriving at registration and re-registration decisions as well as in setting residues limits on food. These precautionary standards are used to remove unreasonable risks from pesticide use to farmers, consumers and the environment. Combined with strict Food Quality Protection Act standards, major improvements in science, and an increase in the use of safer, less toxic pesticides, the overall trend is one of reduced risk from pesticides. Those at greatest risk of harm from pesticides are farmers and applicators who handle and mix concentrated products and apply them in the field. They have high lifetime exposure to pesticides and studying their health is important in understanding current risks and informing the direction for future improvements. The largest study ever conducted on this subject has been underway for 22 years. 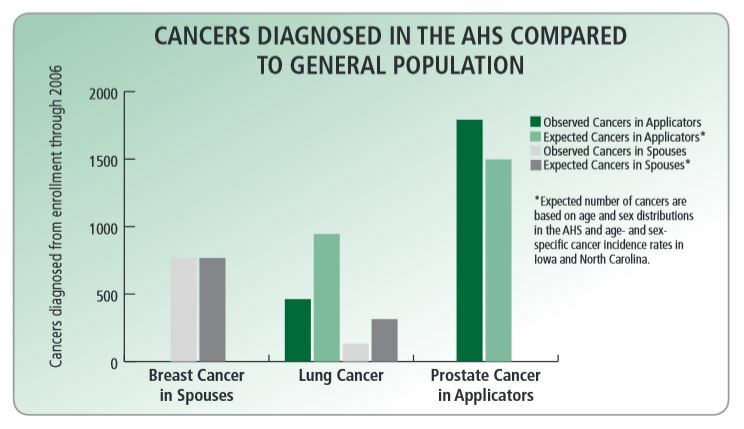 The Agricultural Health Study (AHS) is a long term study of cancer and other health outcomes in more than 89,000 licensed pesticide applicators (mostly farmers) and their spouses from Iowa and North Carolina. The AHS began in 1993 with the goal of answering important questions about how agricultural, lifestyle and genetic factors affect the health of farming populations. The study is a collaborative effort involving investigators from National Cancer Institute, the National Institute of Environmental Health Sciences, the Environmental Protection Agency, and the National Institute for Occupational Safety and Health. 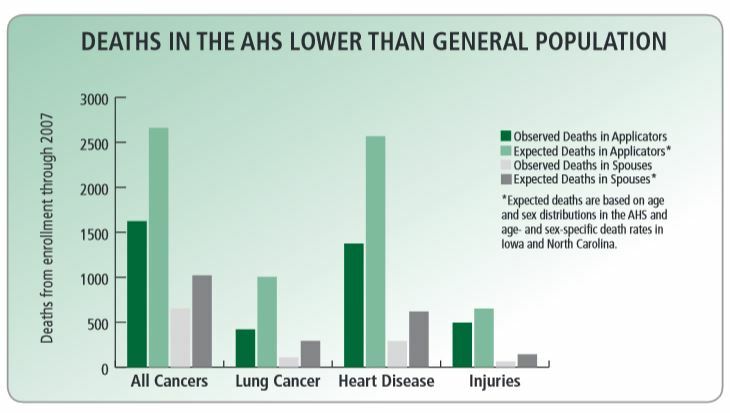 The first follow up after a relatively short five years found that compared with the general population in the two states, AHS participants had a very low mortality rate. The ‘healthy worker effect’ typically seen in groups of working populations, a healthier lifestyle with lower cigarette use and high levels of physical activity may have been responsible for the low mortality. • Study participants are less likely than the general population to die from heart disease, cancer, diabetes, lung diseases, and liver diseases. • Rates of smoking-related cancers, such as oral, esophageal, pancreatic, lung, and bladder, are lower or similar to rates in the general population. • Overall injury deaths were lower, but deaths related to machinery continue to be higher among AHS farmers compared to non-farmers. • A few cancers are more common among AHS farmers, including prostate cancer. Additional studies are being carried out to learn more about the risk of developing these cancers. In making pesticide decisions “EPA considers epidemiology studies that are available as part of its human health risk assessment data and actively supports the Agricultural Health Study.” Their iterative approach of using the best science to identify any unacceptable risks should continue to make pesticides safer. The overall health of pesticide applicators and their spouses, especially for lower mortality and lower overall cancer, reflects well on years of effort by scientists, chemical producers, government research and regulatory agencies, and health and environmental advocacy groups resulting in safer pesticides. Yet, groups like the Center for Food Safety in Hawaii completely ignore this good news and cherry pick findings from the AHS by only highlighting continuing areas of concern. For instance, a recent AHS publication found that protective glove use and hygiene habits by pesticide applicators modifies the associations of specific pesticides with Parkinson’s disease, but CFS only asserts that Parkinson’s is a threat. A well informed public and their policy makers are necessary to keep making progress in society, and they deserve to hear the complete story about pesticide safety and be treated with more respect. The Future Role of Pesticides in US Agriculture. 2000. Board on Agriculture and Natural Resources and Board on Environmental Studies and Toxicology, Commission on Life Sciences, National Research Council. National Academy Press. Washington, D.C. Agricultural Health Study. About the Study. Blair A, et al. 2005. Mortality among participants in the agricultural health study. Ann Epidemiol. 15(4):279-85. Waggoner JK, et al. 2010. Mortality in the Agricultural Health Study, 1993–2007. 2011. Am. J. Epidemiol. 173 (1): 71-83. Furlong M, et al. 2015. Protective glove use and hygiene habits modify the associations of specific pesticides with Parkinson’s disease. Environ Int. 75:144-50. 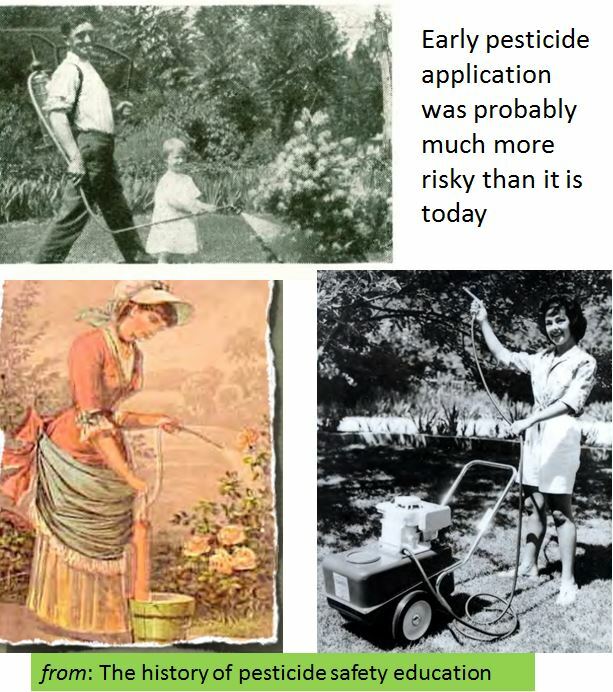 The history of pesticide safety education. Virginia Cooperative Extension.